Chemical storage safety is a crucial factor of chemical handling that should not be overlooked. As far as chemical storage safety goes, U.S. Chemical Storage has a few ways we can help you. Chemical storage safety starts with a safe storage facility. That’s the first place we can help you – our chemical storage buildings are custom-built, designed for safety and compliance. Compliance with federal, state, and local regulations is always the safest course of action, because it not only protects you from unwanted fines, but it maintains a safe environment within your chemical storage facility. These regulations are in place to protect your personnel, community, and environment, as well as your well-being. Heeding them and practicing compliant chemical storage procedures will safeguard your facility from potentially dangerous incidents. Chemical storage safety procedures will prevent hazardous situations that can impede productivity by causing evacuations, and can help your personnel remain healthy even in the presence of harmful chemicals. When it comes to chemical storage, all procedures should be designed to maximize safety. Certain practices like good housekeeping can promote a safe environment by making labels easy to read, preventing contamination and hazardous chemical reactions, and protecting personnel from knocking over containers of hazardous materials. It also enables personnel to quickly and efficiently detect, identify, and remove chemical leaks and spills, minimizing damage to inventory and preventing hazardous situations. Safety training exercises are an excellent way to prepare personnel for these potentially harmful events. Your chemical storage building should be designed to facilitate the chemical storage process and promote safe storage practices. 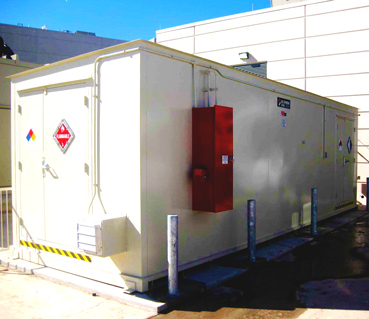 By equipping your chemical storage building with any of our optional accessories, you further enhance chemical storage safety, providing protection and relief from potential hazards such as fires, explosions, and other chemical reactions. Your chemical storage building can be furnished with personal safety equipment in case of contact with toxic or corrosive materials. As always, U.S. Chemical Storage is dedicated to bringing you the safest options in the chemical storage industry. Let us help you achieve compliance and chemical storage safety with any of our storage building selections.